MICHAEL DiGregorio admitted his uncle and former NBA Rookie of the Year Ernie DiGregorio served as inspiration for him to pursue his dream of becoming a professional basketball player. 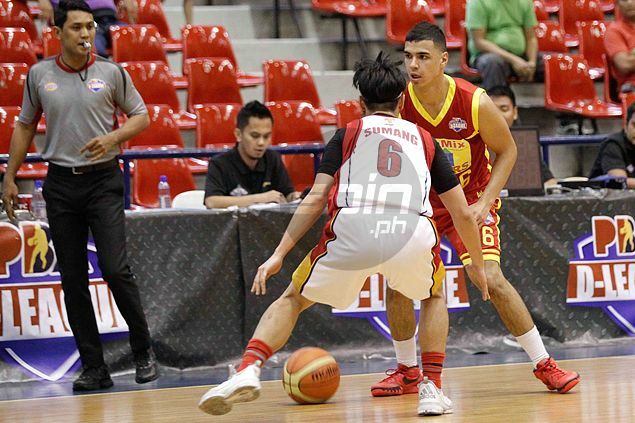 The 24-year-old Fil-Italian is taking a big step as the McKendree University standout applied for the coming PBA draft following his stint with Racal Motors/KeraMix in the last PBA D-League season. During his D-League stint in the recent Foundation Cup, DiGregorio established himself as a deadly three-point shooter after topping the eliminations in three-point accuracy behind a 43.18 percent clip (19-of-44). He also averaged 11 points a game for the Mixers. DiGregorio said his uncle Ernie, a first cousin of his father David, is one of the major reasons why he was inspired to make basketball a career. The older DiGregorio had a short but illustrious NBA career in which he won Rookie of the Year honor during the 1973-1974 season following his stint with the Buffalo Braves, now the Los Angeles Clippers. ‘Ernie D’ as he was aptly called, DiGregorio also played for the Los Angeles Lakers and the Boston Celtics before finishing his NBA career in 1978. The younger DiGregorio, whose mother Ercelia traces her roots to Malasiqui, Pangasinan, said his uncle made him aspire to become a basketball player, too. “My grandmother, Mary DiGregorio, always used to send me clippings of articles about him as well as different books and magazines which had all his stats and achievements. Seeing all those things as a young boy motivated me even more that I already was to continue to push and try to be a basketball star just like him,” said DiGregorio in an email interview with Spin.ph. Michael said Ernie also gave him advice in his pursuit to become a pro. “The last time we spoke when I was in Rhode Island, he was always preaching about being aggressive, being creative, working hard, and allowing your game to speak for itself,” said Michael. In preparation for the August 23 draft, DiGregorio went to Chicago to be with longtime trainer Jeff Pagliocca, who also works with the NBA, overseas, and Division 1 college players. “I train twice a day, six days a week. The training is geared for high intensity skill development in all facets of the game. On top of that, I also do strength and conditioning four days a week,” said DiGregorio, who was recruited to play in the Philippines by Matthew Manotoc and Marvin Espiritu. DiGregorio said he can offer a lot more than his three-point shooting to the team which will select him in the draft. “Whichever team selects me, they are going to get a player that is going to work extremely hard, is coachable, and is willing to do whatever it takes to help make the team successful. I pride myself on my work ethic and there is never going to be a problem with me coming early and staying late to really put the time in to work on my craft. “They are going to get a player that can really shoot the ball extremely well, create off the dribble, and lock down and guard someone,” said DiGregorio.